It’s all done. Party and ceremony are optional. For anyone thinking of tying the knot on Okinawa but are not sure how, look no further. Getting married in Japan is a little different than getting married in America. To become legally married you do not have to go to a church or have a ceremony. All you need to do is to visit the nearest town or city office closest to your residence. If you are an American citizen living on base you can visit a variety of different city offices; however, you must ensure the base you are living on is within the districts of those city limits. For example, Kadena Base residents have the choice of Kadena Town Office, Okinawa City Office and Chatan Town Office. However, before you head to your nearest town of city office to get married, you are going to need some paperwork completed. There are three documents you must possess; an affidavit, proof of citizenship, and a marriage application. The affidavit can be obtained at the legal services office or the US embassy. This affidavit will be in English, so you will need to get this translated from English to Japanese by an official translator. 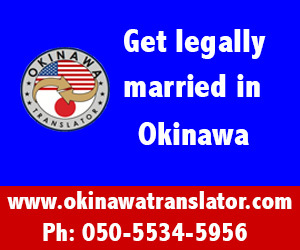 There is a certified official translator located in Chatan called Okinawa Translator that specializes in legal documents for US-to-US citizen and Japanese-to-US citizen marriages. Along with your affidavit you will need proof of your citizenship. Proving your citizenship can be done by providing your passport or birth certificate. Once you have your affidavit and proof of citizenship, the next step is to complete the marriage application. The marriage application must be filled out in Japanese, and two witnesses are required to sign the document. A translation office such as Okinawa Translator can help you fill out the application, and act as your witnesses if you cannot provide witnesses of your own. Once all three documents are complete, you are ready to submit your paperwork to the Town or City Office. Note that there is no need to prepare for a celebration at the city office. The City Office is simply the place you submit your paperwork and receive your marriage certificate. In Japan your ceremony is completely separate from this, held on a separate date, and has no legal connections. The City Office will check over all your documents to ensure that everything is accurate, and that you are legally eligible to get married. 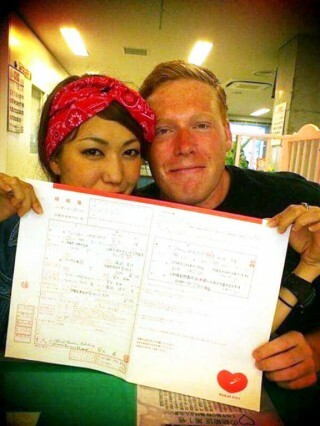 They will then issue you a marriage certificate, which will be in Japanese. The legal services office on the base requires an English marriage certificate. Because your marriage certificate is in Japanese, you must take this to the translation office to be translated back into English. When you provide the English version of your marriage certificate to the legal services on base, you are finally officially married. The Japanese marriage certificate you received from the City Office is a nice keepsake and memory for your time spent on Okinawa. Although there is a bit of paperwork and translation involved, it’s really not that difficult, and many Asian countries such as Hong Kong, Singapore, Taiwan and mainland Japan praise Okinawa Island as the most romantic place on earth to get married. Uruma City Tourism and Product Promotion Fair Feb. 16 and 17. Playgrounds on Okinawa are the best hands down!